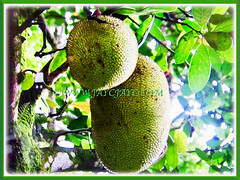 The Jackfruit or Jack Tree is well known for bearing the largest fruits of any tree in the world, reaching as much as 35 kg in weight, 90 cm in length and 50 cm in diameter. Jackfruit is the national fruit of Bangladesh. It is also the state fruit of the Indian states of Kerala and Tamil Nadu. Botanical Name: Artocarpus heterophyllus (syn. : Artocarpus integrifolia, Artocarpus integrifolius). 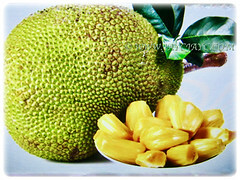 Common Names: Jackfruit, Jack Tree, Jakfruit, Nangka in Malay. Etymology: The genus name Artocarpus is derived from the Greek words artos, meaning bread and karpos, meaning fruit. The specific epithet heterophyllus means diversely leaved or having leaves of different types on the same plant. 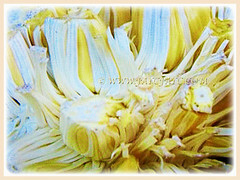 Its common English name, Jackfruit is named in honour of William Jack (1795-1822), a Scottish botanist who worked for the East India Company in Bengal, Sumatra and Malaysia. Origin: Native from India to the Malay Peninsula. An ornamental and perennial tree with edible fruits. Features: Artocarpus heterophyllus is from the genus Artocarpus that consists of approximately 60 species of trees and shrubs. A medium and evergreen tree that grows between 16-30 m tall and with trunk 80 cm in diameter. Bark is rough or scaly, dark grey to greyish brown in colour. When young, crown is dense and conical but when older, it becomes rounded and spreading. Leaves are thin, leathery and obovate-elliptic to elliptic. The evergreen leaves are smooth on the surface and rough on the undersides. Stipules are ovate-acute, deciduous and leave ring-like form on the twigs. 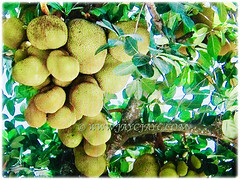 Jackfruit tree is the largest tree-borne fruit, reaching as much as 35 kg in weight, 90 cm in length and 50 cm in diameter. 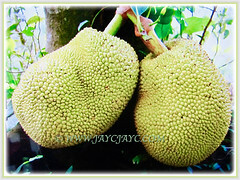 A mature Jackfruit tree can produce about 100 to 200 fruits in a year. 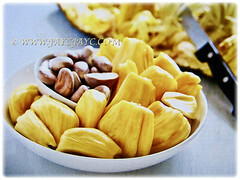 Jackfruit is a multiple fruit that is composed of hundreds to thousands of individual flowers. It is the fleshy petals that are eaten. It is monoecious and produces unisexual flowers with both sexes present within the same plant. The plants produce small, greenish, female flowers that grow on short and fleshy spikes. Following pollination, the flowers grow into a syncarpous fruit. These are capable of growing into very large sizes. You can determine the fruit’s maturity by tapping the fruit. It will produce a dull and hollow sound with the skin’s colour changing from pale green to greenish or brownish-yellow and the spines will flatten and the space in between will widen. Then harvest it by cutting the stalk with a knife. As the fruit is not hardy, it is best to carefully lower it to the ground. 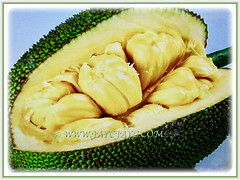 Culture (Care): Artocarpus heterophyllus or Jackfruit can be grown easily with a little more care. Soil: Humus-enriched, loamy and well-drained soils. However, it’s able to adapt to any type of soil. Others: Do regular pruning to retain the tree’s height to below 6 m. When it grows above 3.6 m tall, reduce its main trunk to 2.4 m to encourage the growth of dense branches. Feed the tree once every three months with a slow release and balanced fertiliser. When it starts to bloom, feed it with a 8-3-9 fertiliser by following the manufacturer’s instruction for amount and rate. Generally free from serious pests and diseases. Nevertheless, watch out for jackfruit borer, fruit flies and birds. Covering the fruits is a great option to save fruits from fruit flies and birds. For subtropical and temperate regions: Hardiness: USDA Zone 10-11, though can be grown in zone 9 with care. Artocarpus heterophyllus or Jackfruit is a tropical to subtropical tree. Plants perform best in frost free climates. Established plants will tolerate an occasional light frost but young plants may be killed by any frost. Plants are intolerant of temp below -2.2°C. 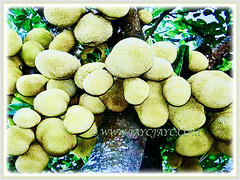 Jackfruit tree cannot tolerate frost and drought, even though it’s a tough tree that can withstand severe temperatures. A mature tree can bear up to 47°C heat and if acclimated, about 0°C cold temp for a short time. Mulch heavily around the tree when temperature goes down below 1.6°C in winter to insulate roots from cold. Mulch it in summer to save moisture and prevent weeds from growing. Some varieties of Jackfruit tree can reach up to 30 m and there are some dwarf varieties like ‘Black Gold’ that grow up to only 3-6 m tall. 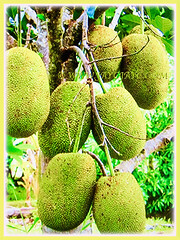 Jackfruit tree has a long life of more than 100 years. Propagation: Easily propagated from seeds that germinate within 35-40 days but in suitable condition, will start as early as within 10 days. Alternatively, it can be propagated fro stem cuttings but it’s somewhat a difficult task. 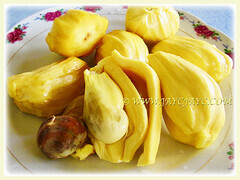 Usage: Artocarpus heterophyllus or Jackfruit produces excellent sweet and aromatic fruits to whet your appetite. A single tree provides enough home-grown fruits that can be relished by your family or shared with neighbours. In Asia, Jackfruit is also used as a meat substitute for vegetarians because its texture resembles those of pork and chicken. They can be eaten as is or used in making syrups, pastries, cakes, and ice creams. Its unripe fruits are used to prepare mouthwatering curry recipes, soups, puree and pickles. Ideal as a tree to provide shade, shelter and natural habitat to birds and pollinators.